Configuring Enterprise TV 5 to use your IR Blasting Hardware. This article will explain how to configure Enterprise TV 5 to control your IR blasting hardware. Open the Enterprise TV Web Administration Page. Select the Admin tab in the web admin, and select "Tuners" on the left side of the screen. Click the Edit button next to the tuner you would like to configure. Under "External Tuning Properties", select USB-UIRT as your External Tuning Interface. Select Cable/Satellite Box Model from the drop down list. NOTE: If you don't see your set-top box model in this list, you can use our training app to create a profile specifically for your set-top box. 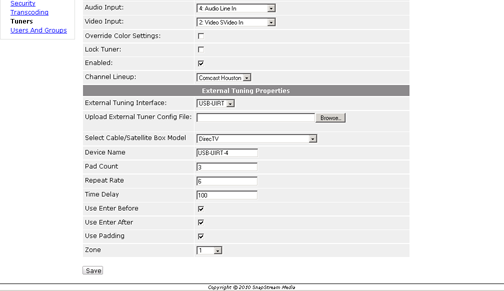 Please see this article for instructions:Creating an IR Tuning Profile for Enterprise TV 5. Fill in the Device Name field with the USB-UIRT name you would like to use for this tuner. Select the Zone you would like to use with the USB-UIRT specified in the Device Name field. Zone 1: This controls the blink emitter that is plugged into the gold side of the stereo to mono adapter. Zone 2: This controls the blink emitter that is plugged into the silver side of the stereo to mono adapter. Zone 3: This uses the front of the USB-UIRT for IR blasting. Zone None: This blasts a signal to all 3 zones. This is great for testing all of your USB-UIRT connections. The rest of the settings on this screen will affect how Enterprise TV will use the remote to tune channels. NOTE: We recommend only changing these settings after determining that Enterprise TV is unable to properly tune the set-top box. Pad Count: Specifies the number of digits a set-top box requires to change the channels. For example, a box may require the user enter "013" to get to channel 13; this corresponds to a Pad Count setting of 3. Repeat Rate: The number of times Enterprise TV should rapidly repeat a single button press to ensure that the set-top box receives it. Increase this number if the set-top box is not receiving digits, and decrease it if the set-top box is receiving duplicate digits. Time Delay: The time, in milliseconds, that Enterprise TV should wait before sending the next button press when changing channels. Enter Before: Simulates pressing the "Enter" or "OK" button of your remote before entering digits. If you set-top box falls asleep and needs to be woken up with "Enter", use this option. Enter After: Some set-top boes will not change channels at all unless the user hits "Enter" or "OK" after entering the channel number. Enable this option if the set-top box for this source behaves in this manner. Use Padding: Use this option to enable or disable the Pad Count. Repeat steps 3 - 9 for the other tuners that you would like to configure for IR blasting. If you have clustered Enterprise TV Servers: Make sure that each USB-UIRT is connected to the correct server. Example: You may have two different USB-UIRT's named USB-UIRT-4, but each will be plugged into a different server. That is how our software can tell them apart even though they have the same name. USB-UIRT-4 on server 1 will only be able to be configured for tuners on server 1.